One Canadian woman has been acknowledged as a master of the ancient art of medal making for more than half a century ï¿½ yet few Canadians know her name. Dora de Pedery-Hunt is one of the world's most honoured sculptors and medalists ï¿½ yet the woman who's work adorns our currency lives in poverty in Toronto ï¿½ a national treasure who struggles to pay her rent. This documentary poses the question: ï¿½What happens to our elderly distinguished artists who are still working? 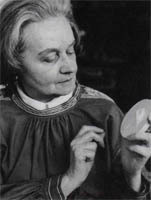 Dora de Pedery-Hunt began her life in Canada washing floors and windows, before opening an entirely new area of the arts for Canadians. This documentary is the story of one woman's passion and creativity and her role in carving a niche in the then little known field of medal sculpting. Her story is also that of the penniless immigrant, the struggling artist and the determination of the human spirit against great odds.